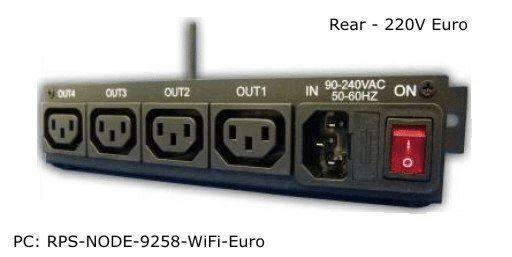 RS232 Serial Port – Allows you to read the status of the remote power switch. 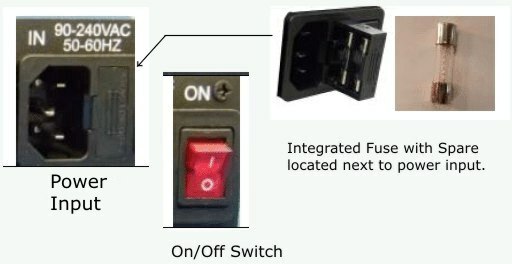 Power Status Indicators – When illuminated indicates a power On condition to the indicated rear power port. Reset Button – Depressing this button for 10 seconds will reset the RPS unit to original manufacturing settings. Restart Button – Will power the RPS-NODE-9258 off then on for a complete system reboot. 4 Output Power Ports – Each ports power setting can be individually controlled within the remote power switches web based interface. 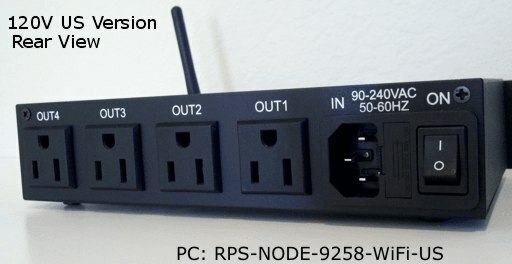 Master Power Control Switch – Turns the RPS-NODE-9258-WiFi On or OFF.